Kharins Quest − Where are the Elders? My level 81 dwarf paladin circled the deep water filled crater, with its fractured masonry, shattered beams and flame charred earth for the fourth time. The golden question mark was clear as day but the Lunar Harbinger, Lunar Celebrants and Vendor, and the Stormwind Elder were nowhere to be seen – either improbably clinging to the sides of the devastated area or standing on protruding stone work in the middle. To be honest, I hadn’t really expected them to be there with the total destruction of the Park precinct following the Sundering but this was where my in-game quest finder was leading me. I soon caught up with them, standing serenely outside the gates of Stormwind amidst a flurry of fireworks and lunar beams as if nothing untoward had happened. 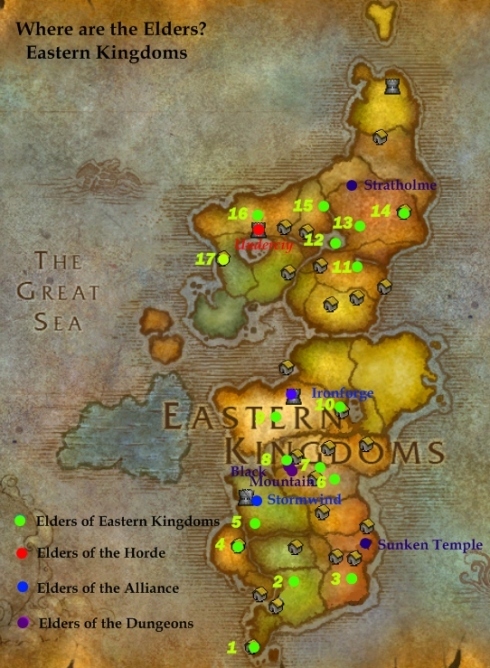 In 2011 there have not been many changes to the Lunar Festival apart from the some drastic changes to the lands and maps of Azeroth, a change of location of a handful of Elders (see below) and the introduction of flight in the old kingdoms. Flying (for those 60+ with the Cataclysm expansion who have paid for the training) certainly makes visiting some 75 elders across the major cities, selected dungeons, towns and hamlets of Kalimdor, Eastern Kingdoms and Northrend much faster and easier, especially when essaying into hostile territory (flying high and then descending vertically makes visiting elders in most factional capitals and settlements almost safe and easy). The Lunar Festival, clearly tied into the celebration of Chinese New Year both in content (fireworks, ancestral coins, red packets, festival foods and clothing) and timing. It centres on journeys across the continents of Azeroth to pay respect to the Elders – past heroes of both factions. Elders come from the ancient races indigenous to Azeroth including Night Elves, Dwarves (both of flesh and stone), Taurens and their ancestral cousins the Taunkai (though not Trolls, Gnomes or Goblins). Unlike many traditional cultures, modern Western culture often puts much more emphasis on youth, new skills and knowledge, invention, progress and change than wisdom from the past. Yet it does not hurt to be reminded what we owe to past generations and to wisdom that has been forgotten or perhaps unnecessarily dismissed. To paraphrase an “elder”, the scientist and theologian Isaac Newton, “If we have seen further it is because we have stood on the shoulders of giants.” I wonderr if you were to select 75 or more influential people in the history of Earth, who would they be and why? Kharin’s guides Honoring our Elders and Lunar Firework Frenzy give information on the quests and achievements of this festival. 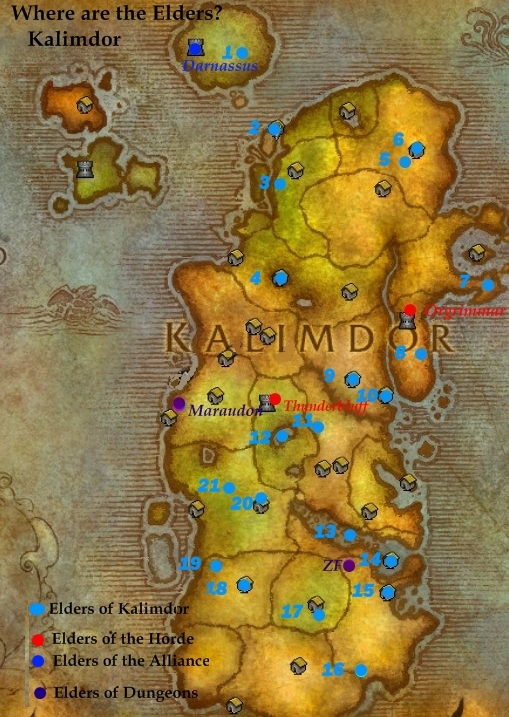 This guide gives the location of the Elders of the Eastern Kingdoms and Kalimdor and the Elders of the Horde and Alliance while Elders in Danger will give the locations for the Elders in Northrend and the Dungeons and Newly Remembered Elders of the Cataclsym gives the location of those in 80+ areas. The locations have been presented on a map of each continent to help you work out your most efficient routes depending on your starting points, faction etc. Once you are close enough to the elder to interact use the keybinding (eg SHIFT-D or whatever key you set up) to interact, click the macro, then click complete quest. If you are not successful the first time, rezzing on top of the elder may help – just wait a few minutes so that the 85 elite guard has time to despawn. There are seventeen elders scattered across the Eastern Kingdoms. While in some cases the areas and maps around them have been changed by the recent sundering, their locations remain virtually unchanged. While difficlut due to the spawning of elite 85 guards at factional towns like Brill and Sepulcher, Elders of Eastern Kingdoms can be completed before flight becomes available at level 60. 1. Elder Winterhoof (40, 73) is standing on the roof of the ruined goblin bank – enter the top room of the Booty Bay Inn, turn sharp left at the balcony and continue past the Horde flightpath. 2. Elder Starglade (53, 18) is standing just right of the second flight of stairs to the entrance of Zul Gurub, Northern Stranglethorn. The elite trolls no longer patrol this area with the decommissioning of Zul Gurub. 4. Elder Skychaser (57,47)is on the top of the Sentinel Tower, Sentinel Hill, Westfall. 7. Elder Dawnstrider (53, 24) is just below Flamecrest to the north of Thassarian Ruins in Burning Steppes. 8. Elder Ironband (21, 79) is outside Blackchar Cave just south of the Searing Gorge entrance into Black Mountain, in southwest corner of Searing Gorge. 9. Elder Goldwell (54, 50) is near the Inn in Kharanos, Dun Morogh. 10. Elder Silvervein (33, 47) is standing near the road near the graveyard and on the other side of the Flight Master in Thelsamar, Loch Modan. 11. Elder Highpeak (50, 48) is standing on a small hill just north of the Creeping Ruin in the central part of the Hinterlands. 12. Elder Moonstrike (51, 36) is standing on the walkway between the towers of Scholomance (she is not inside the instance), Western Plaguelands. Either fly up to the walkway or enter the tower, turn right (not left into the instance) and then up the stairs to Elder. 13. Elder Windrun (36, 69) is inside Crown Guard Tower in the southeast of Eastern Plaguelands. 14. Elder Snowcrown (76, 55) is close the southern wall in Light’s Hope Chapel, Eastern Plaguelands. 15. Elder Meadowrun (64, 36) is some way in the Weeping Cave (65.3, 38.6) in northeast of Western Plaguelands. 16. Elder Graveborn (61, 53) is standing just inside the east gate and next to a plague wagon in the south of Brill, Tirisfal Glade. There is an 85 elite deathguard who spawns once you are detected making it difficult for lower level alliance (ie < 60) to reach the elder though flight (60+) helps. 17. Elder Obsidian (45, 41) is standing in the middle of the cemetery in the Sepulcher, Silverpine Forest. There are twenty-one elders scattered across the Kalimdor. While in most cases their locations remain unchanged, in most there are changes in the areas and maps around them and a couple elders have relocated to new settlements (notably the Elder of Auberdine and the Elder of Camp Taurajo). For Alliance at least Elders of Kalimdor is virtually impossible to complete before getting flight. While spawing of an elite 85 guard in The Crossroads and particularly the placement of Elder Runetotem next to Burok in Razor Hill can be overcome by speed in interacting with the elder, the extreme difficulty in getting into Mulgore without flight makes it virtually impossible to achieve. 1. Elder Blade Leaf (57, 53) is standing in front of the herbalism/alchemy trainers’ hut in Dolanaar, Teldrassil. You can either fly (it is now possible to fly directly from Darkshore despite some fatigue) or take a ship from Stormwind, ride through the red portal at Ruthven Village and then ride west from the Bank tree up the wide bridge/ramp through the Warrior’s Terrace, across the courtyard and out the gates. Follow the road east to Dolanaar. 2. Elder Starweave (50, 20) is standing close to the shore on the southern outskirts of Lor’Danel, northern Darkshore. She is still called the Elder of Auberdine, which however was shattered with the recent Sundering. 3. Elder Nightwind (38, 53) is standing amongst ruins, just past where Winna’s Kitten (a green striped big cat), along a path to the north (right) of the road into Jadenaar in central Felwood. 4. Elder Riversong (36, 49) is standing in the Moon Shrine near the Flight Master on the northwestern edge of Astranaar, Ashenvale. 5. Elder Brightspear (53, 57) is in front of one of the ruined buildings on the side of east side of the frozen Lake Kel’Teril, Winterspring. 6. Elder Stonespire (60, 50) is standing on small hillock between the bank building and the armor and weapon shop in Evertook, Winterspring. 7. Elder Skygleam (65, 79) is at the ruined Ravencrest monument, between the feet of the gigantic statue – at the end of the upland peninsular in southern Ashvara. If you need to run/ride there are two land bridges (just past the Southern Rocketway Terminus) that connect this area with the rest of Azshara. 8. Elder Runetotem (54, 44) is standing within the walls close to the southern entrance, next to the flight master of Razor Hill, Durotar. Not only will a 85 elite guard spawn but the elder is standing behind the Flight Master Burok and in the middle of the Wyverns who will attack any alliance character on sight. However, if you rez right on top of the Elder and interact fast enough by using the macro detailed above, it is actually possible. 9. Elder Moonwarden (49, 59) is standing behind the flightmaster within the walled area at the Horde village of the Crossroads, Northern Barrens. 10. Elder Windtotem (68, 70) stands on a small hill just north of the bank and flightmaster and south of the engineer trainer in Ratchet, Northern Barrens. 11. Elder Highmountain (41, 47) is standing on the southern outskirts of Vendetta Point which overlooks the impenetrable Great Gate built across the entrance into Mulgore from the Southern Barrens. While he is still called the Elder of Camp Taurajo, he no longer stands within this now ruined settlement. 12. Elder Bloodhoof (48, 53) is standing next to Ahab Wheathoof and just south of the bridge across Stone Bull Lake in the northern outskirts of Camp Bloodhoof, Mulgore. Since Cataclysm, a impassable gate has been placed across the entrance into Mulgore making it impossible to run/ride there. To reach Mulgore you need either fly (60+), take the Zeppelin from Orgrimmar to Thunderbluff or, possibly, get a warlock summons into the area. 13. Elder at Skyseer (46, 51) of Freewind Post in central area of a Ten Thousand Needles. It is now surrounded by water as well as being taken over by the Grimtotems following Cataclysm. If you don’t have flight this post can still be acessed by a maze of walkways from Razorfen Downs or a ramp and 2 rope bridges on the southern side of Freewind post which can be reached by swimming. 14. Elder Morningdew (77, 75) of Mirage Raceway is on the southern loading barge of the Fizzle and Pozzik’s Speed Barge, close to the site of the old raceway, Ten Thousand Needles. There is both a ramp up on the southern side as well as a submerged hatchway at the back to up onto the barges (if you swim rather than fly there). 15. Elder Dreamseer (51, 28) is standing close to the arena cage in centre of Gadgetzhan, Tanaris. 16. Elder Ragetotem (36, 80) is outside the Ruins of Uldum, in the Valley of the Watchers, Tanaris. 17. Elder Thunderhorn (50, 76) is standing on a small hill just north of the biggest hive entrance in the middle of the Slithering Scar, just south of Marshal’s Last Stand in southern Un’goro. 18. Elder Bladesing (53, 36) is standing in the moonwell at Cenarion Hold, Silithus. 19. Elder Primestone (30, 13) in among the elementals in Crystal Vale in the northwest of Silithus. 20. Elder Grimtotem (77, 38) is in the Lariss Pavilion (back entrance to Dire Maul) in eastern Feralas. 21. Elder Mistwalker (62, 32) is in the Maul (arena) in the Broken Commons, Dire Maul, Feralas. I Undercity – Elder Darkcore (66,38) is in the throne room in the upper city (the ruins of Lordaeron) – it’s the domed building past the open courtyards though it is possible to fly into the room and stay mounted. II Orgrimmar – Elder Darkhorn (52, 60) is on the roof area next to the Flightmasters. He can be reached by flying over his position and then descending. Otherwise, you can run/walk through the front gate, keep going straight until you reach the entrance to the Drag. There is a lift which will take you to the roof and, once reaching the roof, the Elder is close by the Flightmaster. III Thunderbluff – Elder Wheathoof (72, 23) is in the Elder Rise, the edge of the mesa. He is easy to reach by flying. Otherwise take the north lift, turn left at the first building and go up the stairs, take the bridge across to the Elder Rise. Wheathoof is on the left past the Lunar festival celebrants. 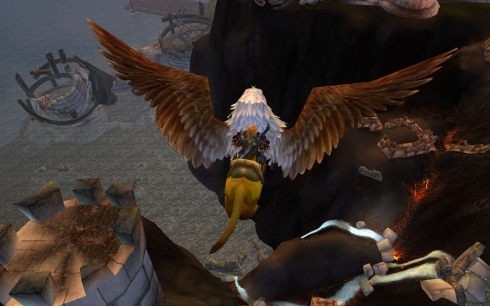 Of course mages, priests and paladins can jump off the rise once they have paid their respects. i Darnassus – Elder Bladeswift (39, 32) is standing at the base of a tree in the Cenarion Enclave. It is now actually possible to fly (through the fatigue) from Darkshore up the trunk of the tree into Teldrassil and Darnassus. Otherwise, it would be necessary to take a ship from Stormwind, or walk/swim (may die a couple of times though it is possible for some classes to heal through fatigue) to Rutheven Village. Then ride through the red portal into Darnassus, cross the bridge and ride to the left past the Bank tree, across the bridge to the Cenarion Enclave area. ii Stormwind – Elder Hammershout (34, 50) is no longer in the destroyed Park precint. He is just outside and to the east of the gates of Stormwind where the Pilgrim Bounty’s tables were set up. iii Ironforge – Elder Bronzebeard (29, 17) is in the pool outside the Hall of Mysteries in the Mystic Ward which is on the left of the main entrance and the Commons. It is possible to fly through the gates and continue flying all the way to the Elder. Have fun and don’t forget to make meaningful connections with the “elders” (both past and lving) in you life. Came here from googling, and thank you so much! Was so easy to find them with your descriptions of their location. 8. Elder Ironband (21, 79) is outside Blackchar Cave just south of the Searing Gorge entrance into Black Mountain, in southeast corner of Searing Gorge. Just got “To Honor One’s Elders,” thanks to you! I’ve had this browser window open for over a week. Probably time to restart my computer . . .